Patrick is a junior business manangement major and coaching minor. From the tennis court to excelling in his classes, Patrick Whaling is a great example of a Golden Gustie. Patrick is currently a Junior business management major and coaching minor on campus and is an active member of the Gustavus community. Patrick is grateful for his experience both on the Men’s Tennis team and working with organizations on campus like Big Partner Little Partner. “I am on the Men’s Tennis team. It is great to be part of such a historic program where we have opportunities to compete at a high level. My teammates are what make playing tennis a special experience. “We get to travel to fun places and compete with some of our best friends. I participate in BPLP, this is my first year being involved in [Big Partner Little Partner] and am very happy with how it has gone. “My little partner and his family have treated me like one of their own, it is great to have some involvement in the community,” Patrick said. Senior and business management major, Mohanad Alhouni, has been Patrick’s teammate for three years and has been his doubles partner for two, where they have been placed as the number one spot, prompting a successful career. Alhouni admires Patrick’s dedication and commitment to the task at hand. He also is inspired by the passion Patrick has for the sport that they both love. “He is passionate at what he does, always supportive, and willing to go out of his way to help others,” Alhouni said. Patrick is from Manakin Sabot, Virginia, which meant he had to adjust to the Minnesota lifestyle and weather. However, that was no hard task for Patrick as noticed by his teammates. “He had to make an adjustment living far from his family, by developing his personality and fitting in the right way as a Gustie,” Alhouni said. Patrick’s success on the court comes from a driven personality with a rare balance of lifting up others as well, creating a sense of community on the team. “With his competitive nature, he…is a key factor in our success on the court this year for the Gustavus Men’s tennis team. “He is also a great addition because he is outgoing, great community guy and enjoys [bringing] people together and having a good time,” Alhouni said. Patrick isn’t only a great teammate, but he supports his peers in the classroom as well. Sophomore Maggie Leininger joined a class late this past Fall and was nervous about being able to catch up, until she met Patrick. “I joined the class late and being intimidated by everyone else in the class, I chose to sit by him. My seat selection was super lucky because right away we became good friends as I annoyed him with chatter in class,” Leininger said. Patrick is also admired by his fellow Gusties with how involved he is on campus, participating in organizations such as Big Partner Little Partner and intramural sports. “Patrick is a great Gustie. He is friendly to everyone and is involved in campus activities…In addition to being nice, Patrick is a hard worker as he works very hard at Tennis and Fortnite,” Leininger said. Patrick is a nationally recognized tennis player, competing in singles and doubles. Patrick is a talented athlete, but also hopes for the wellbeing of all he competes with. “Patrick is super fun to have on campus because he is lively. “He is a great athlete, not only in tennis but any sport he attempts. Walleyball (a hybrid game of volleyball inside a racquetball court), soccer, volleyball, basketball, spikeball or just add -ball to the end of a word and he has it down. “It is fun to watch Patrick play and even to attempt to compete against him. Patrick is motivating to his friends and teammates and he hopes for the success of all,” Leininger said. Patrick is able to grow and understand that this will help him succeed in whatever he does, especially his passion for tennis. One of his coaches, David Lachman, who has been a Gustavus staff member since 2012 and the Assistant Men’s Tennis Coach, especially recognizes this characteristic in Patrick. “Patrick’s growth as a player, leader, and individual makes him an excellent choice as Gustie of the Week. Specifically, the work he has put in on and off the tennis court over the past three years. “Patrick has gone from a good first-year middle-of-the-pack player to a nationally recognized singles and doubles competitor,” Lachman said. Lachman also believes that Patrick embodies the image of a hardworking Gustie. 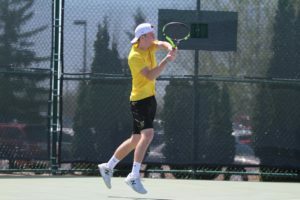 “He has embodied the Gustavus Tennis philosophy of the Three Crowns, and has been able to let go of the things outside of his control,” Lachman said. Patrick has also helped to boost the dedication of the fans of the Gustavus Men’s Tennis team through social media. “Patrick is a constant source of positive energy. He has great ideas, and uses those ideas to help others. One specific thing Patrick contributed this year was the idea to expand our social media offerings. “This has helped to increase involvement and excitement from fans of Gustavus Tennis, and will hopefully continue to bear fruit into the future,” Lachman said. The skill of taking a goal and working until it comes to fruition is one that Patrick doesn’t lack and uses to benefit the Gustavus community. “Patrick has a unique talent of taking the things he has interest and passion in, and elevating them with his vision. “This is certainly a tremendous benefit for Gustavus, and will also be valuable for any venture he sets his mind to in the future,” Lachman said.